12” H x 18” W Rectangle, 13” Round. 11” H x 12” W Rectangle, 13” Round. 11” H x 8” W, 9.5” Round. 13’ 6” L x 1” W x .035” T.
Manual tension (30,000 psi) provides consistent square cutting accuracy. Blade speed is variable through a precision balanced step pulley and heavy-duty worm gear transmission. Blade speeds are 85, 150, 230 and 330 SFPM. The broad speed range allows for optimum cutting of a large variety of materials. Infinitely variable feed rate is hydraulically controlled for fast, accurate cutting. Settings are made at the operator’s control station. The saw frame is raised hydraulically using a push button mounted on the operator’s control panel. Blade Drive: 3 H.P., Hydraulic Pump: 1/2 H.P., Coolant Pump Motor: 1/8 H.P. - Machines are available with either 230 or 460 volt, 3 ph., 60 Hz. Electrics. Voltage must be specified on original order. Carbide Blade Guides provides reduced vibration, heat, and blade stress providing longer blade life and accuracies of + .002 per inch of cut material. Powered from the drive wheel of the saw, the brush changes speed with the blade to assure that chips are being removed from each gullet, improving cutting performance and blade life. Hydraulic vise design clamps and holds the work piece securely. The vise is operated by a selector switch located on the operator’s control panel. Maximum vise opening is 18”. 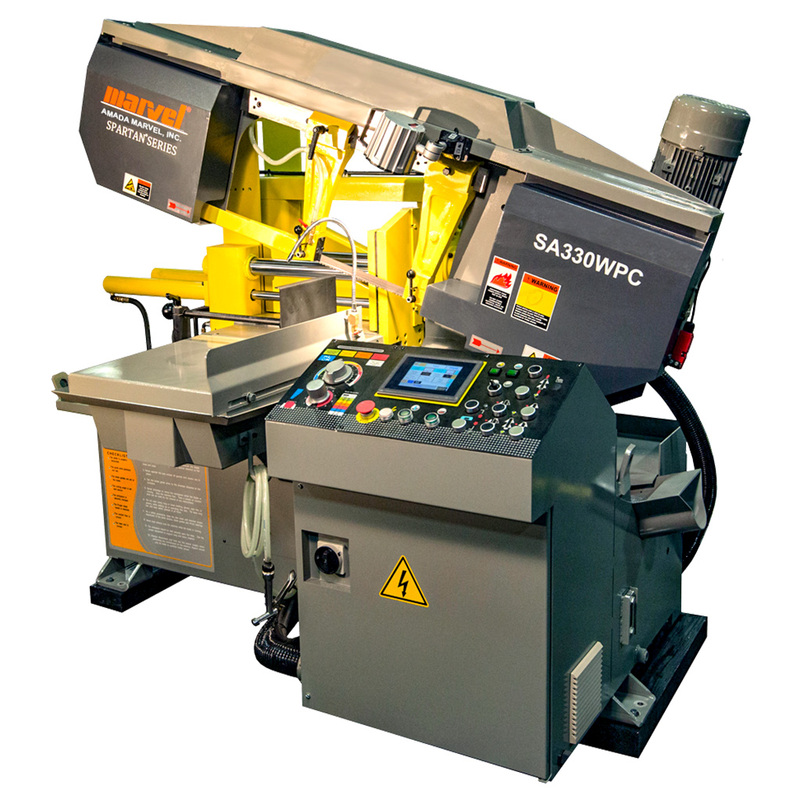 The saw frame swivels a full 60° to the rear and 45° to the front for optimum miter cutting capability. The pivot shaft has sealed bearings for maintenance free operation, while a pointer and angle scale (-60° TO + 45°) make setup fast and easy. Stops are provided at -60° and +45°. Operation of the machine is safe and convenient from the swing arm pedestal mounted on the machine base. 5’ long. Table is constructed from 3” x 4.1 lb./ft. Channel with five 2.5” diameter ball bearing rollers on 12” Centers and two track stands. Hydraulic clamping pressure to the work holding jaws can be adjusted as required to hold solid or thin wall material. Table is constructed from 3” x 4.1 lb./ft. Channel with five 2.5” (63mm) diameter ball bearing rollers on 12” Centers and two track stands. Track sections can be used on either the loading or discharge side of the machine and are free standing. Hydraulic clamping pressure to the work holding jaws can be adjusted as required to hold solid or thin wall material, allowing the piece to be held securely and without distortion.